The shopping-dining area around the intersection of Cedar and Warrensville Center Roads in Cleveland Heights and University Heights is known as Cedar Center. In the 1950s and 1960s it may have been the center of Cleveland's Jewish population. For 38 years (1956 - 1994) one of the most popular places at Cedar Center was Corky and Lenny's Delicatessen. In 1994 Corky and Lenny's (no one said "delicatessen") closed. WKYC and WEWS television covered the end of what had become a community institution. See these telecasts in a five minute video by Ray Glasser. For a nine minute video taken in September 1984 and posted to YouTube click here. 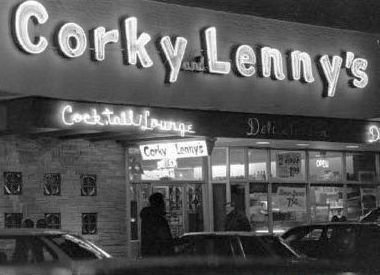 Corky and Lenny's continues in a location on Chagrin Road, east of I-271, that was opened in 1973. 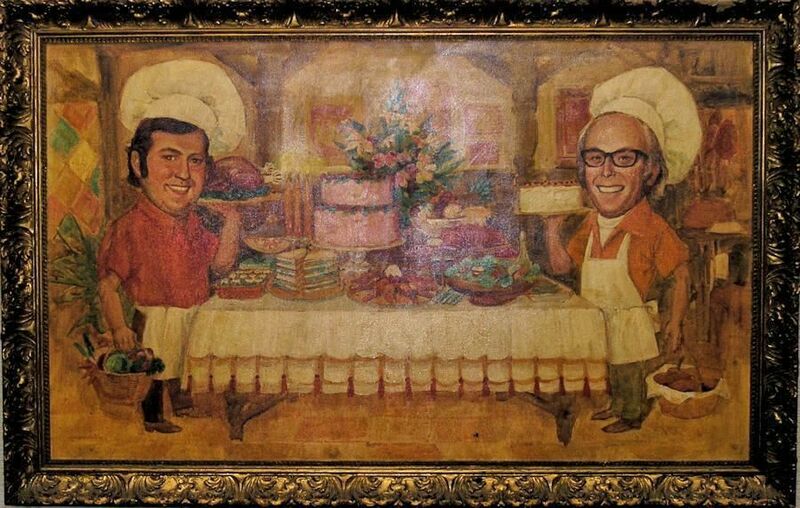 This acrylic on canvas painting by David Kutchko, depicting owners Sanford (Corky) Kurland (right), Leonard (Lenny) Kaden (left), and plenty of food, was commissioned by the restaurant and deli in the late 1950s. Leonard Kaden gave it to the Western Reserve Historical Society in 2003. On June 30, 2011 the WRHS had an event to announce an endowment from the Jewish Federation of Cleveland that would secure the future of the Jewish Archives. 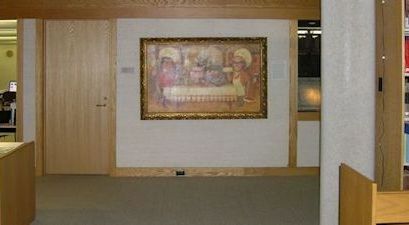 Planners of the celebration hung the Corky and Lenny painting in the Research Library. It garnered so much attention that it is still on display. Sanford Kurland died at age 81 on October 22, 2011. Leonard Kaden and his wife Nina share their time between Cleveland and Scottsdale Arizona. After much searching the only exterior picture of Corky and Lenny's we could find was taken at night and is undated. Probably taken around 1990, just a few years before it closed. Thank you to The Plain Dealer and photographer Dale Omori. Enter the Western Reserve Historical Society. Turn right to enter the Library - Research Center. Walk past the tables used by researchers. Before you reach the library shelves, stop. Look to your left. You'll see it as shown above. One entrance fee gives visitors access to the Auto Museum, History Museum and Research Library. For more information about the Western Reserve Historical Society, located in Cleveland's University Circle, visit www.wrhs.org.